Article led by Donna Cromeans (@DJRiter) with contributions by Jamie Coudeville, Saloni Gajjar, Sam D, & A D Ogutu. Article edited by Donna Cromeans. Article prepared for publication by Aimee Hicks. Television is filled with extremely talented performers who spend a good portion of successful careers in supporting roles. They ably support the leads, carve unique niches for themselves, create iconic characters and most certainly garner attention come awards times. Rarely do such performers get cast as the lead in their own shows, which is a shame, as the quality work of these performers would seemingly demand they receive the recognition they deserve. Such a performer is SpoilerTV's Staff Choice Performer of the Month for April, Sandra Oh. Following a ten-year run as the iconic Dr. Cristina Yang on Grey's Anatomy, she is now the talk of this TV season, creating yet another iconic character in MI6 Agent Eve Polastri, in one of the best new shows on television, the brilliant Killing Eve on BBC America. The series is sharp, filled with both humor and suspense, and superbly written by the incredible Phoebe Waller-Bridge. And, it is all anchored by Oh in a mesmerizing performance and her equally mesmerizing co-star, Jodie Comer as serial killer, Villanelle, they share an incredible on-screen chemistry. How good are these two actresses in this show? So good, that it was renewed for a second season before the first episode had even aired. So good that for seven consecutive weeks since its premiere it showed demo ratings growth which was a first for a scripted series, according to BBC America. So good, that both Oh and Comer's names are being buzzed about as being on or near the top of their Emmy nomination list. Accolades well-deserved for an oft under-rated Oh. Her amazing performance in Sorry Baby (1x4), has garnered her the title of SpoilerTV Staff Choice Performer of the Month for April. Upon closely examining this episode it is easy to see why Oh earned the honor. This episode highlights a life-changing moment in Eve Polastri's life. The moment serial killer/assassin Villanelle, killed Eve's long-time friend and partner, Bill (David Haig) in the previous episode, literally in front of her, Eve changed dramatically. As stated in the SpoilerTV review of the episode, "Until now, in an odd way, Eve's pursuit of Villanelle has been almost like a game or challenge built upon her fascination with serial killers. Villanelle changed all that when she killed Bill. His death has shaken Eve to her core. With this likely being the first time Eve has lost someone close to her in such a violent fashion, it's no longer a challenge, she is on a mission now." Now it was personal. 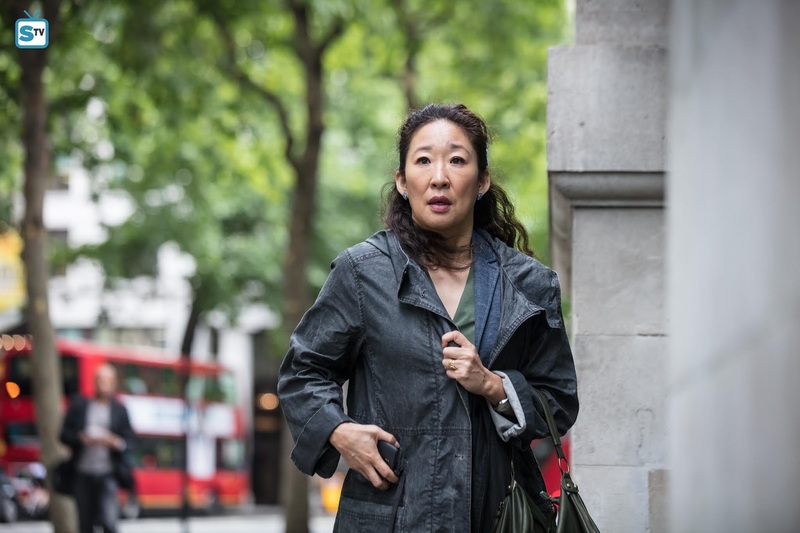 Thanks to Killing Eve, Sandra Oh has been able to show off her talent in ways many have never seen before. In the opening scenes of Sorry Baby, the scene where Eve is at Bill's funeral, the expression she uses to portray Eve's incredible sadness at losing her friend and partner is incredibly substantial and intense. While everyone else is singing, she's completely off in another world. She's trying not to cry, but you can see in her eyes that the tears are right behind the surface, ready to fall at any moment. She rebuffs her husband, Niko's (Owen McDonnell) attempts to comfort her. Then, when Frank (Darren Boyd) comes up to do the eulogy, Eve is so disgusted at what he says but is still affected by some of the things he says about Bill. The words hit home hard for Eve and Oh manages to show that without saying a word as she lets the tears finally flow free. Eve finally can't take it anymore when she's face to face with the crying baby of her deceased friend and walks out in the middle of the eulogy. The way Oh adds the simple but impactful touch of Eve barely being able to breathe but trying hard to as she hurries out is nothing short of fantastic. Outside, Eve has composed herself. The way Oh looks out at the world you can tell that Eve is contemplating Bill's death and what she's going to do about Villanelle. When Elena (Kimberly Howell-Baptiste) follows her outside to check on her, Eve chats with her calmly, but Oh is brilliant when she subtly switches into anger mode after Elena asks what they should do next. She didn't even need to say she wants to kill Villanelle with her bare hands; the way Oh stares hard at Elena already shows that. Later, the tension between Eve and her husband escalates as he tries to comfort her in the only way he knows how with food and drink. Eve is shutting herself off, not only for the world but her emotions as well, as Oh illustrates perfectly, showing the character doing what just about anyone would do, don her favorite PJ's and withdraw, curled up on the couch. She looks waif-like like she's waiting for someone to take care of her. Unfortunately, that someone doesn't turn out to be Niko, who oddly chooses that moment to confront her and demand she quit the investigation. Eve reacts in anger, cruelly lashing out in anger at him, saying she sometimes believed caring about her is the only thing he has. Her barbs hit the mark and Niko recoils, then retreats but not before telling Eve her stolen suitcase had been returned. Oh, reacts with on-point body language in this scene, going from small and vulnerable to rising with righteous indignation, her body vibrating with tension. Oh, crisp sharp delivery and eyes flashing her moment of anger and then instant regret. She drops her shoulders in dejection, realizing she's said something she can never take back. After Niko's departure, the moments where Eve opens her suitcase are very interesting ones. When Eve notices that those aren't her clothes it's clear that she's confused. Oh did a very good job in this scene portraying both Eve's curiosity and her horror when she finally realizes what happened. This is a very short scene but very telling for Eve's personality. Despite her initial confusion, she's still methodical when taking the clothes out of the suitcase. Oh portrays the character as almost detached like it's just another mystery to be solved. Until the note, after which she freaks out and takes it out on her husband, still keeping it from him rather than confiding in him. When Eve meets with Elena and Kenny (Sean Delaney), the moment of horror has clearly passed. Eve has gone back to investigator mode, almost acts like it didn't happen to her but to someone else. She nails the essence of dark humor that permeates the series when she quips to Kenny about not letting a sociopath steal your suitcase with your home address on it. Oh exudes such certain authority in this scene that Kenny and Elena barely argue with Eve. They know with one look that it's pointless. Eve is still talking by the time the group makes it to the office. There are subtle hints that Oh uses to show that Eve is nervous. She can't seem to stay still before entering, either by talking or by fidgeting with her hands. Seeing her friend's desk makes her pause briefly before returning to the task at hand. This may have even renewed her sense of urgency, to capture her friend's killer. As Kenny is explaining the evidence he found, Eve keeps leaning closer and closer to the screen, almost she'll be able to see the information faster that way. Until she makes the connection to Frank and she immediately backs up, partly in disbelief but also because she needs to get out of there and confirm her theory. Oh's performance in this episode has primarily been driven by the grief Eve was feeling about Bill's death; however, she bravely manages to turn that off after Kenny reveals his findings of Frank. When she meets Carolyn (Fiona Shaw) in a sausage shop, we see a different demeanor as soon as she walks in. Oh is almost out of breath when Eve approaches Carolyn who then goes ahead to tell her to take a minute. Oh's mastery of her craft is evident here; she laments about the sausage to appease Carolyn but also uses the opportunity to settle Eve's nerves. She makes use of her body to position Eve close to Carolyn's face on the right side so that she can speak directly in her ear since Carolyn is facing the sausage counter. This is a tactic that ensures every time Carolyn turns her head she's face to face with Eve. This helps level the uneasiness both ladies are feeling. In these few seconds, Oh subtly demonstrates how anxious Eve was with the information she had just uncovered. Since the viewer was not privy to the discussion that might have occurred after the reveal between Eve, Kenny and Elena, Oh begins with a little background information from Eve about a past event that Frank attended. Eve proceeds to explain what transpired at the birthday party, Frank drinking more than usual but Carolyn reminds her that Frank was going through a rough period and Eve interjects that it was because of his wife's illness. Eve acknowledges what Carolyn says but continues to describe Frank's emotional state on that night including his worries about paying for his children's school. The window to get the information out is very small, but Oh speaks fast without making Eve sound alarmist and manages to pique Carolyn's interest enough to want her to spill the news. Carolyn eventually turns and partially faces Eve, which surprises Eve and Oh's body language shifts into an exhausted calmness as Eve explains the findings on Frank. Through the expressions on Oh's face and her shoulders slumping, Carolyn sees how much Eve is heartbroken despite the facade of strength she was trying to portray. Oh quickly corrects her body language to a more stoic one as Carolyn assures Eve that Bill would have wanted her to take her time with the investigation and rush into anything. Despite the concerns from Carolyn, Eve meets with Elena and Kenny to map out a strategy. Oh's control during this brief scene is commendable. Kenny has excellent information for their investigation, but he is not sure how they can proceed. Seeing how tensed Kenny is when Elena tells him that Eve and she will drive to Bletcham, Oh's body language changes, she relaxes her shoulders and uses a gentler tone as Eve reassures Kenny that it was just surveillance and nothing dangerous. Eve and Elena begin the drive to Bletcham, in this scene filmed entirely in the car, Oh again is able to switch Eve's emotions from sad and moody to a more jovial tone. Elena is the driver, so Eve appears more relaxed. Oh's, facial expressions demonstrate that Eve is feeling confident that they have a breakthrough and are on the right course. She then puts on the supportive friend hat and Eve begins a light banter with Elena when she asks if Carolyn mentioned her name. Eve jokes about Kenny having a crush on Elena and Elena doesn't deny it but laughs about it. Oh smiles and for the first time in this episode, we see Eve's face light up since Bill's death. Her ability to emote in many different ways is impeccable. As soon as Eve answers the call from Kenny informing Elena and her that Franks phone was called from inside his house, Oh's face displays worry and concern but she gathers herself and Eve quickly makes the decision to pull over and call Frank. Sandra Oh is perfect in this role of Eve Polastri. She has mastered the art of looking completely terrified and even trying to escape it yet enjoying the thrill of it all. When her character is on the phone with Frank and making sure he doesn't get killed by Villanelle, she exudes these emotions like a pro. Her urgency makes you want to scream at Frank to run faster, too! She keeps you on the edge of your seat. In the final moments of the episode, she gets yet another chance to shine. After she helps Frank get in the car and straps herself in, her character Eve realizes the assassin walking towards them and the one after Frank is none other than Villanelle. Oh's ability to express herself without words and solely through her the emotions her face expresses is brilliant. She's scared, she wants to get away, but she also knows this is her only shot to speak with the killer she is after. She conveys all of this with minimal dialogue. Especially towards the end, when Eve decides to step out of the car and confront Villanelle, Elena and Frank both tell her she is crazy. Again, Oh has that cool and confident aura despite her fear, an ability only a skillful actress can pull off without making it look uneven. 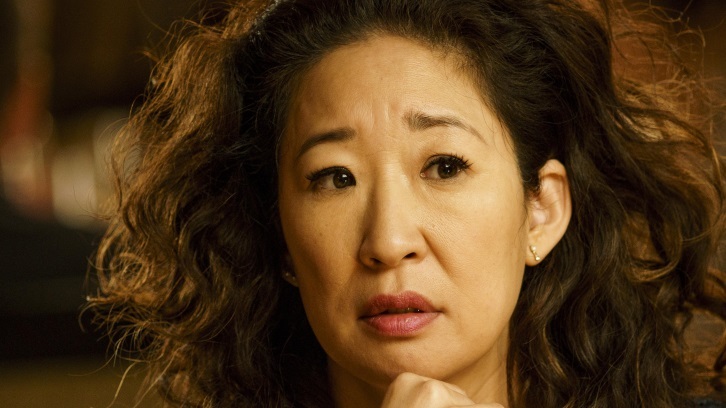 Sandra Oh can most certainly add Eve Polastri and Killing Eve to an already long list of impressive work on her resume. But perhaps, Eve may be one of her greatest creations. This brilliant, quirky, yet determined character surprises at every turn thanks to Oh’s interpretation of the brilliant scripts. Her work in Sorry Baby (1x4), of Killing Eve was award caliber and certainly worthy of the SpoilerTV Staff Choice Performer of the month for April. While this article has looked at some of her finest moments of this episode, there are sure to be some that were overlooked. What were your favorite Sandra Oh moments in this episode? Discuss in the comments below.. PLEASE READ: Please keep comments on topic and just discussing the performances of the winner.